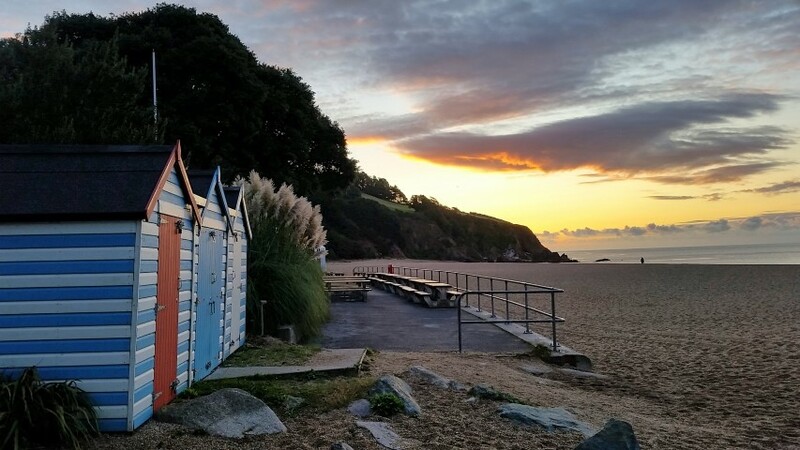 We arrived at the previous camp over (Blackpool Sands) with no definite plan for the third and final week of our September break. The location in Dartmouth left a few options available of which one of the more considered was Isle Of White for four or five days. 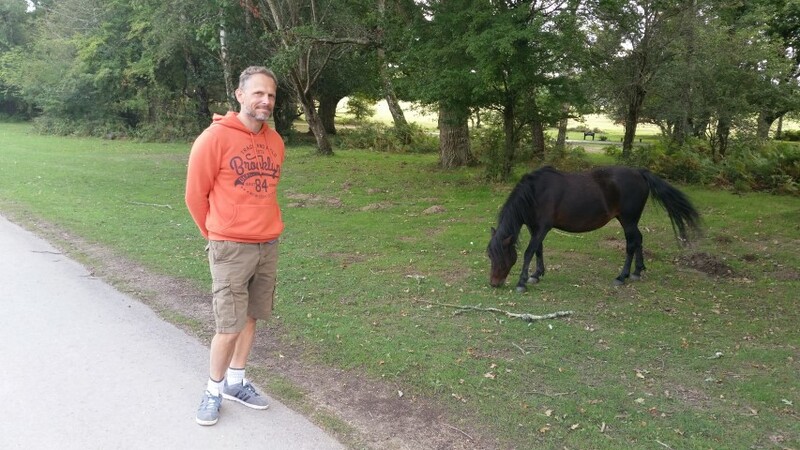 However, for some time I had heard how nice the New Forest was, and after some deliberation both Mandy and I decided to head over and see what all the fuss was about. 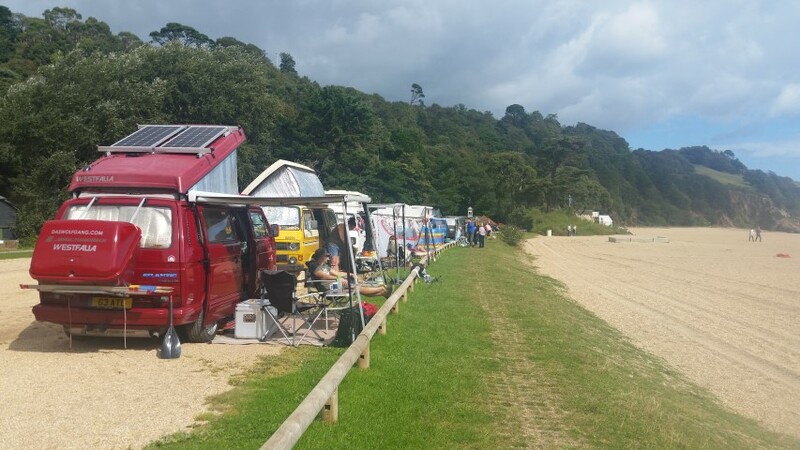 Our mobile data connection at Blackpool Sands beach was almost none existent, so we took advantage of the café wifi connection to explored campsites in the new forest in more detail. 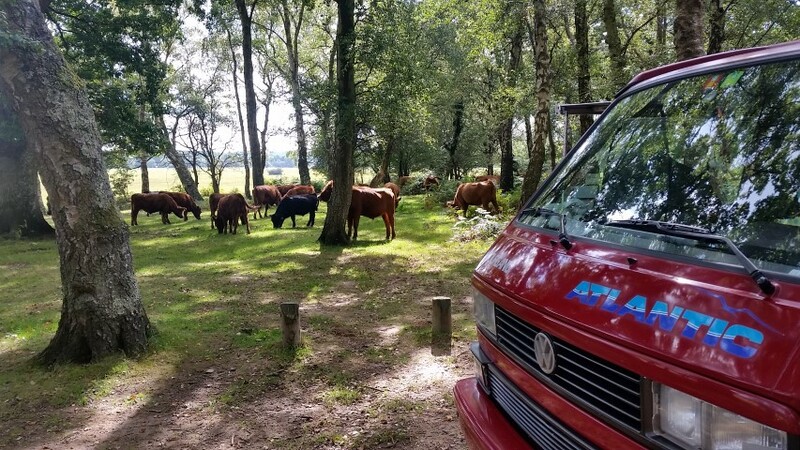 There are a number of locations available for campers, but one particular one focuses on sites for people who like to be surrounded by trees. 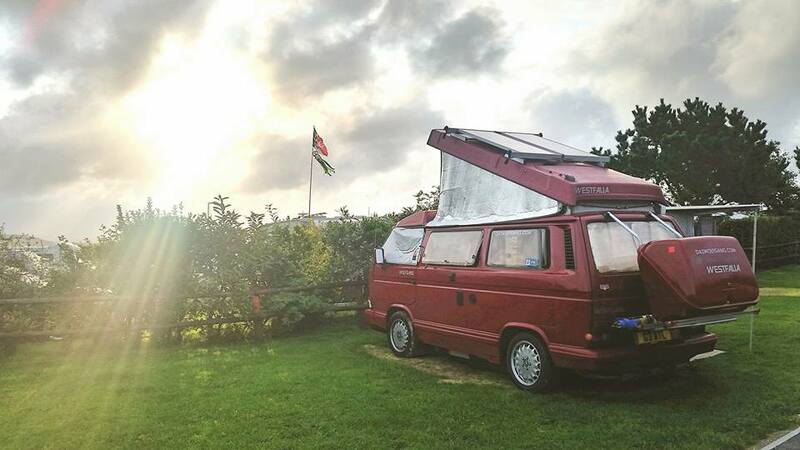 This is under the ‘Camping in the Forest’ website (https://www.campingintheforest.co.uk/england/ ). 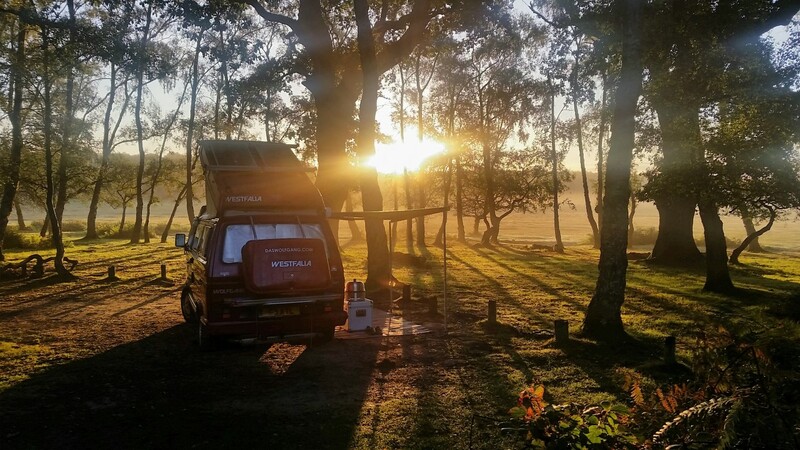 This really ticks the box for us, so we took a punt at a large site consisting of approx 600 pitches called Hollands Wood ( https://www.campingintheforest.co.uk/england/new-forest/hollands-wood-campsite ) . I must admit, it did concern me that it could cater for so many, and I guess I was thinking it would be tightly packed, with very restrictive pitches. How wrong could I be! There are no pre-defined pitches to speak of, and due to the time of year we didn’t have to contend with the school holiday crowds. 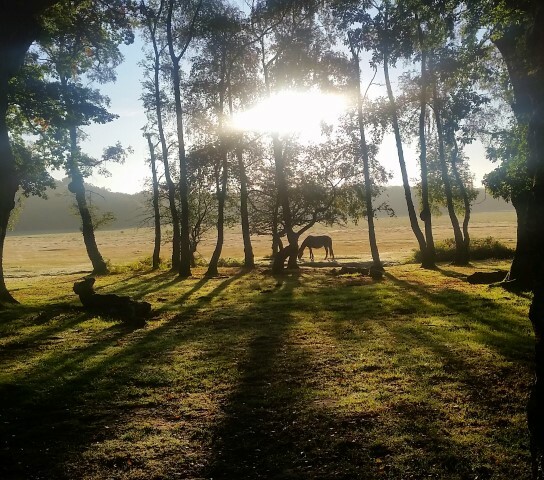 We were advised on arrival that certain pitches were good for the early morning views out from the forest across the prairies towards Brockenhurst Village. Our two weeks holiday prior to this point was excellent. 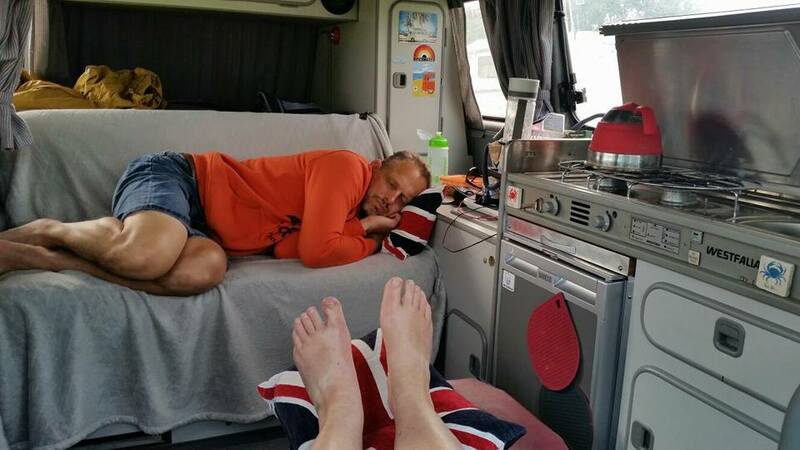 We always love time away in the van visiting different places. That said many of the locations we visited fell into the coastal, beach, quaint village or city break theme. 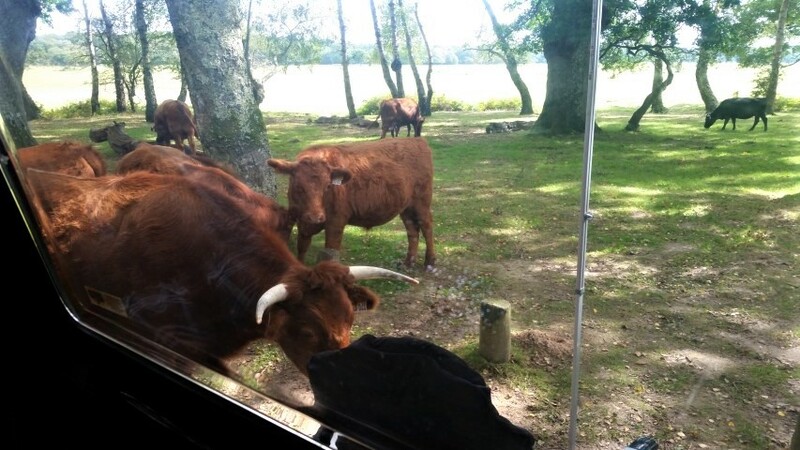 We had never experienced the beauty of the New Forest, and it is so very different to anything else. The amazing vistas are hard to take in, and the closeness to nature is something that both Mandy and myself struggled to comprehend. 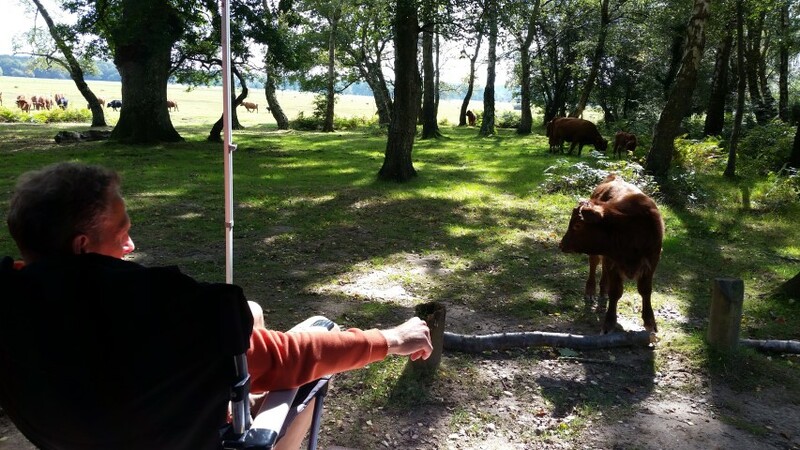 Wild cattle, Shetland ponies, donkeys and horses all roam free throughout the campsites and the village. Life just stepped up a notch 🙂 . The next three days consisted of exploring the area which included Brockenhurst. This is a small village with a further education collage on its outskirts. This means the village has a massive influx of youngsters at certain times of the day. What impact does this have on the local community? Well I guess it works, but it’s a little strange. That said, it’s bazzar to see the animals wandering around the roads in the village. So I guess an open mind and a relaxed acceptance to most things is a requirement for the locals . Most houses have cattle grids to stop none human inhabitants from becoming an on-site nuisance. There are stories of ponies and donkeys brazenly walking into the local stores to eat the fresh produce, having to be coaxed out. It really is hard to paint a picture to the city goer that hasn’t experienced the oddity of animals living in such close proximity to humans, but it really must be on the top of your list of things to do if you haven’t yet experienced this part of the world! Moving on to our next New Forest camp -Round Hill. This was nice, but I think we both agreed that it wasn’t quite as nice as Hollands Wood. It was literally a mile down the road, but the tree canopy was limited making it feel open and exposed. Maybe if we had chosen this site first we would have been happy (not knowing what we were missing), but it was OK! Still ponies and horses wandering around, but it didn’t have the cosy aspect. Dartmouth was the destination for the ninth camp over of our three week break. 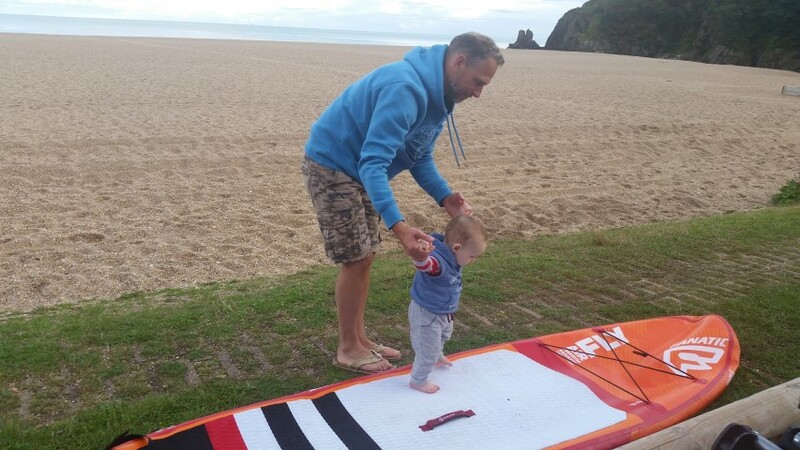 It was a brilliant location for a camp over which happened to be at the very edge of the privately owned blue flag beach of Blackpool Sands. 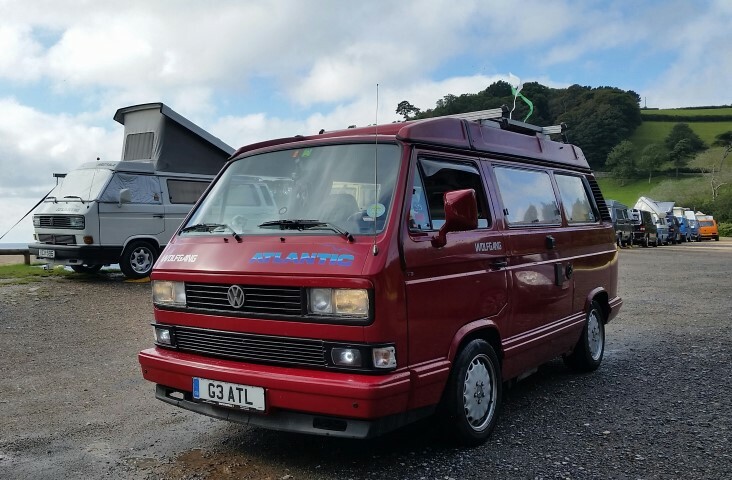 We had done this event the previous two years, and we really enjoyed the like minded company of the people who camped over for the weekend. 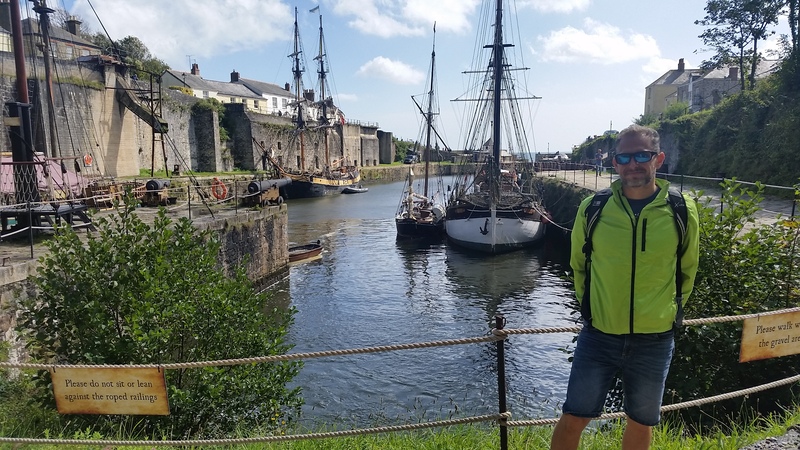 11th September started by visiting Truro. 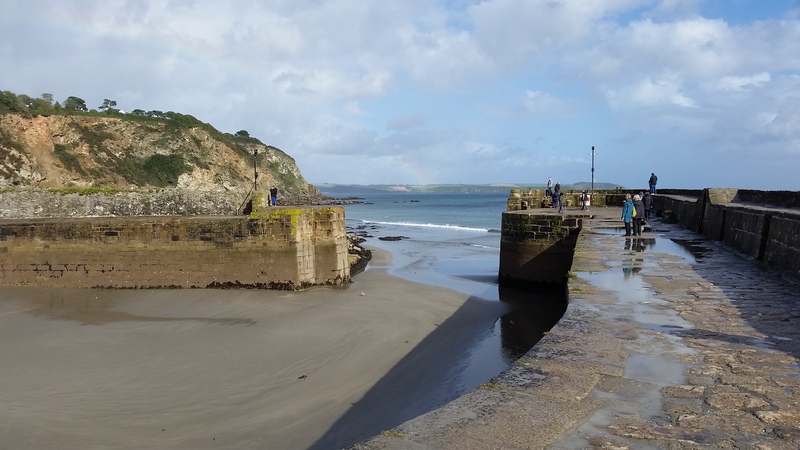 We had skirted around the town the previous year, but felt as the weather was a little unsettled, it may be the ideal time to do a little shopping and have a meal before we headed to our final destination in Charlestown near St Austell. 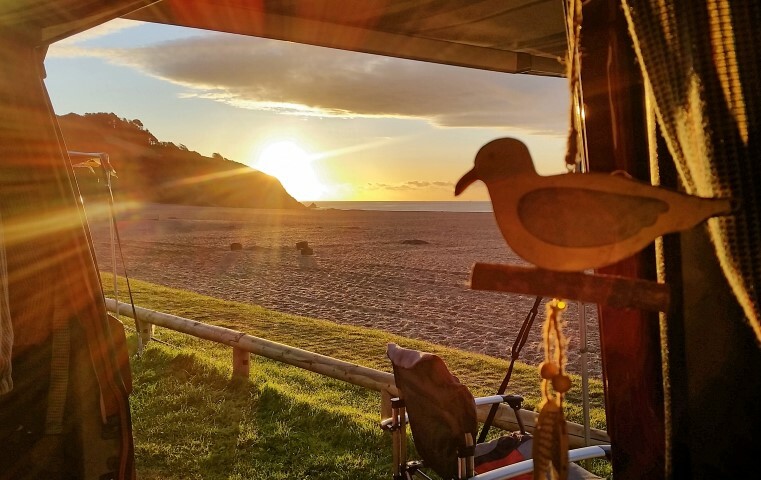 We had seen Broadmeadow House on a review of the 10 best campsites in Cornwall on the Guardian Website. 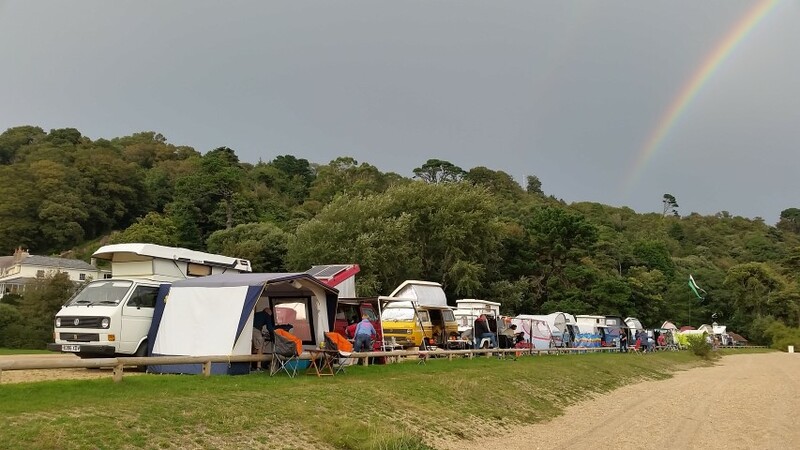 It seemed to tick the box for Mandy and I, with very limited numbers of campers allowed at any one time, and amazing views of St Austell Bay. We arrived at Charlestown and pulled up outside a nice cottage at the end of a quaint street. We had been text by the owner ‘Debs’ earlier on in the day with accurate directions and a question about the type of beverage we would like in our welcome basket. We proceeded through two gates and up a very steep hill into the camping field. The van struggled with traction on the incline on a couple of occasions with the wheels spinning just shy of the top. But eventually we got there and parked up at the lower part of the field. Parked up and ready to camp. 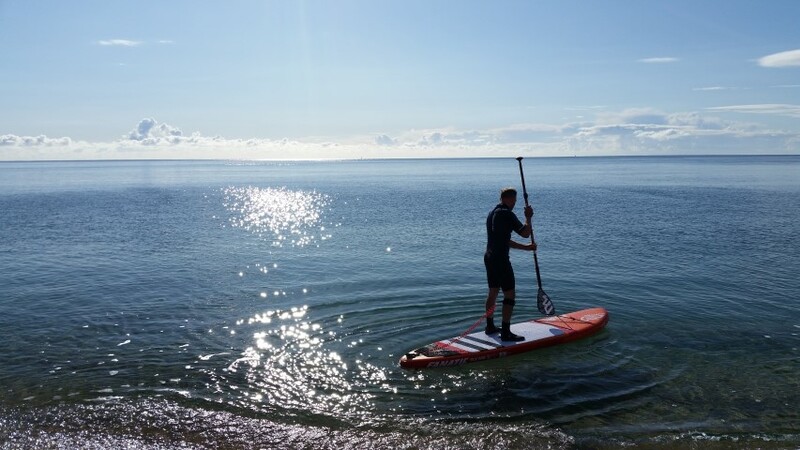 We knew that the winds were going to pick up at some point during our three night stop, and there was almost certainly going to be some rain, but I felt the views out to sea and around the bay were more than going to make up for any unsettled weather we might have. Never the less everything was secured down in anticipation. We had done a little research about the small town before we arrived, and it seemed interesting, although we weren’t exactly sure what to expect. The afternoon of our arrival saw us going for a short walk to try and put the campsite into some context with the surroundings. That evening we saw an amazing sunset, but as predicted this was shortly followed by wind and rain. Well this pretty much set the scene as far as weather was concerned for the duration of our stay, but we were lucky that the indoor attraction of the Shipwereck Museum provided shelter for a morning during the worst stint of rain, and a number of restaurants, galleries and tearooms bridged the gaps during the odd shower. 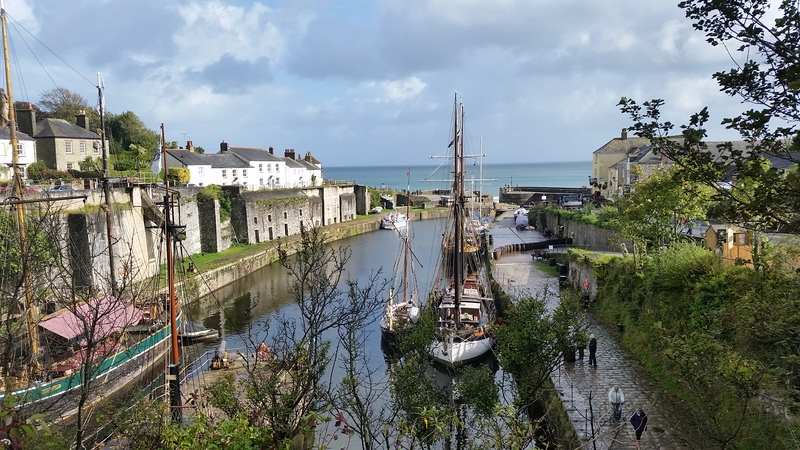 We also paid to have a look around the harbor which was the berthing place for some very old ships and the filming of some of Poldark. 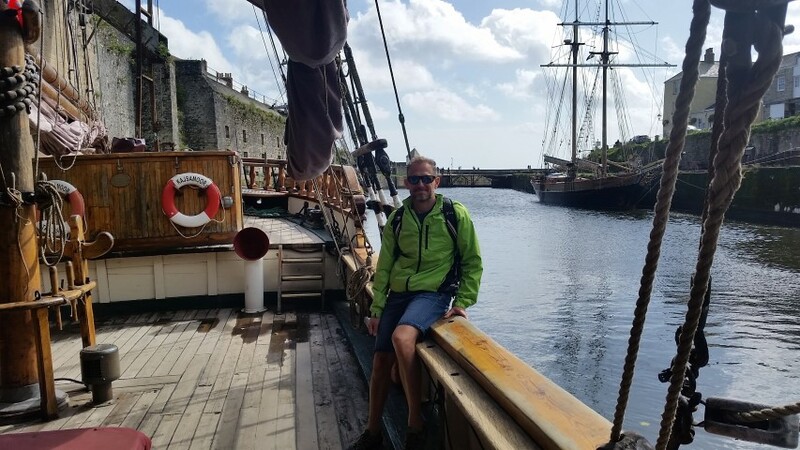 We chose to visit the harbor on our last day, but were advised that we wouldn’t be able to get to the quayside until afternoon due to a ship entering port. We woke up Wednesday morning and looked out into the bay to see the tall masts of an old ship. We had a shower and breakfast, and rushed down just in time to catch the ship entering. Not something you see every day. We pootled around for the rest of the morning having a coffee and perusing the shops. We had eaten at a restaurant the previous day called Wreckers which had a great menu (and cider) so we chose to eat there for a second time while we waited for the harbor to open. I must admit I did question why we had paid for a walk around the harbor when we could see it from a short distance away, but it was interesting. You could walk onto and around an old ship, and there was a fair bit of information to read about the history of the port / harbor. 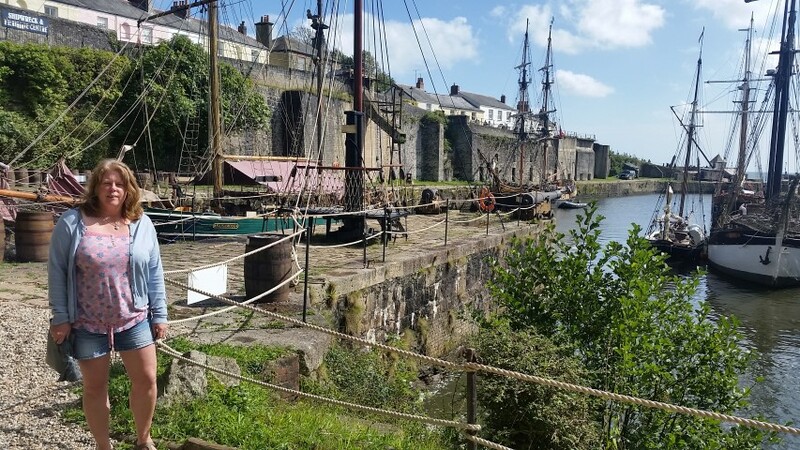 Anyways, I was more than impressed with Charlestown, and both Mandy and I plan to return at some point in the not too distant future. Next Stop. 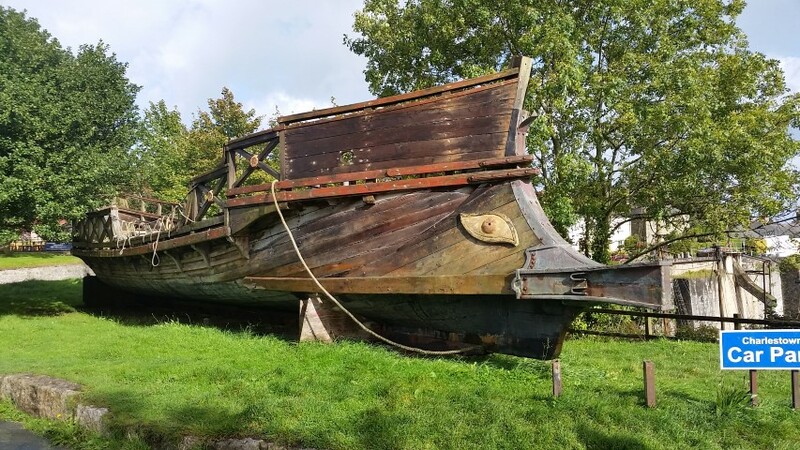 Totnes..
Planning our next port of call wasn’t difficult. We had a couple of options but both decided that Bude looked worth a visit. 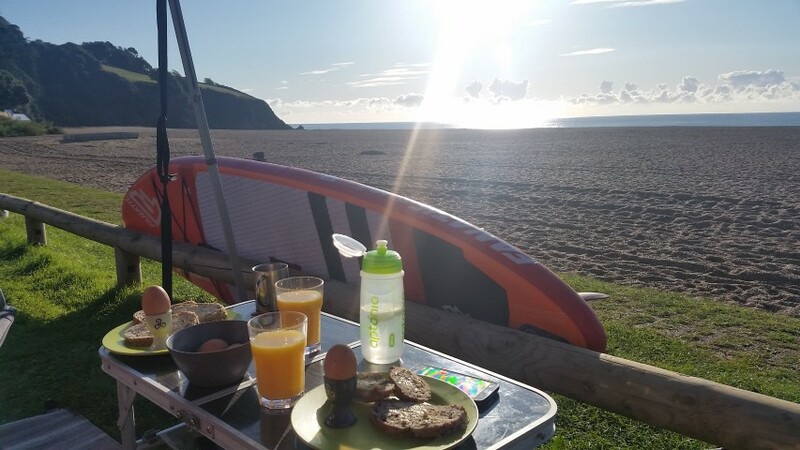 Mandy had friends that had stayed at Bude earlier in the year, and feedback from them meant we shouldn’t be disappointed. As with so many places we visit between campsites, we knew we were only really going to leave with a taste of what the place has to offer. The day was mainly overcast and blustery with the odd hint of sunshine. 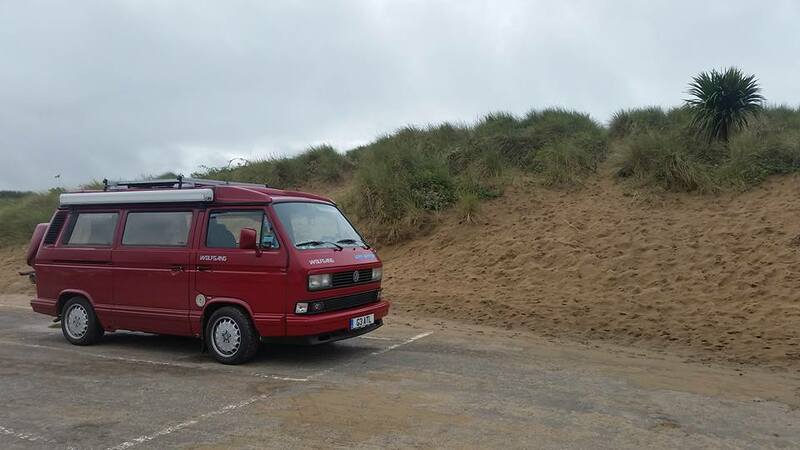 We parked up in the main carpark next to the beach. This was the first contact with sand and the sea, so although the weather wasn’t amazing, we felt an element of excitement. 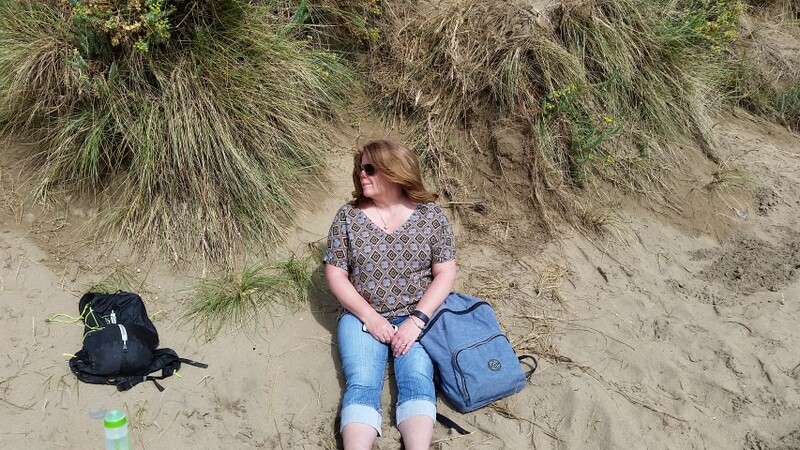 After a brief wander round, a very expensive, but nice serving of Fish & Chips at Urchins Bistro and a sit on the beach, we decided to take a leisurely drive over to Padstow. 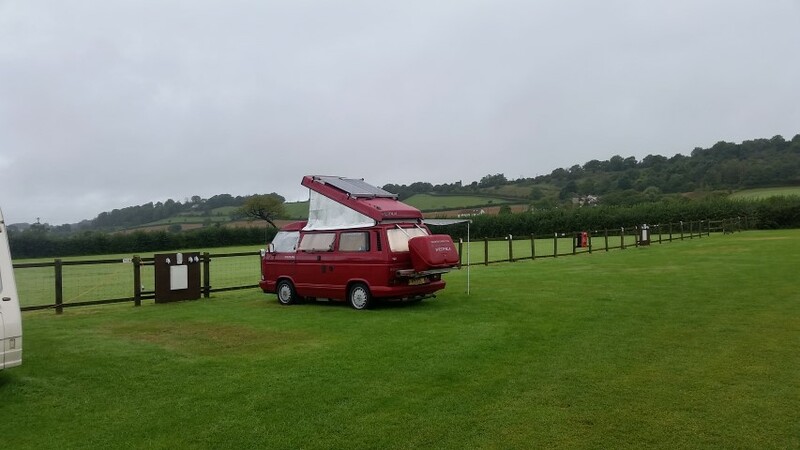 This was our second time at Padstow Touring Park, the first time being last year. During the planning of this holiday we were in two minds whether or not to book in for a second year on the trot, but we both agreed that there was an element of comfort in knowing we liked the campsite, and we left last year knowing there was more to discover at Padstow than our stay there had allowed. Before getting to the campsite we stopped off at the local Tesco supermarket to stock up on Supplies. 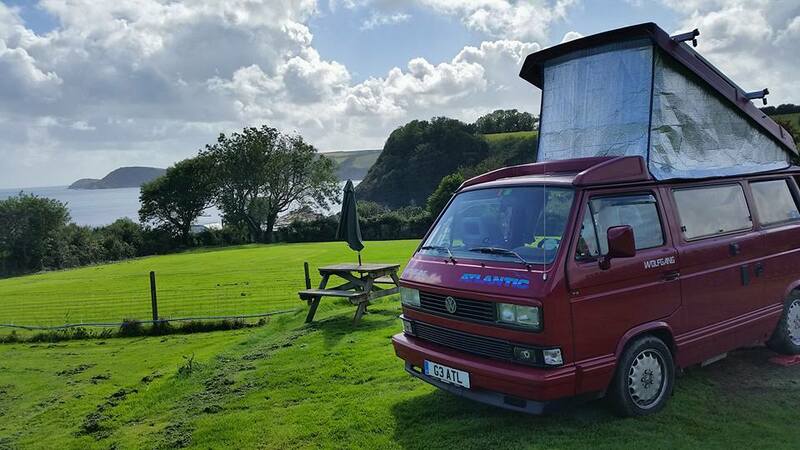 We were there for three nights, and once the van is set up we like to use that as a static base. Knowing this it was important to get fresh bread etc. On arrival at the campsite found ourselves on the all too familiar pitch we had last year. Quite a surprise in light of the campsites many pitches. This pretty much set the scene for the next few days. 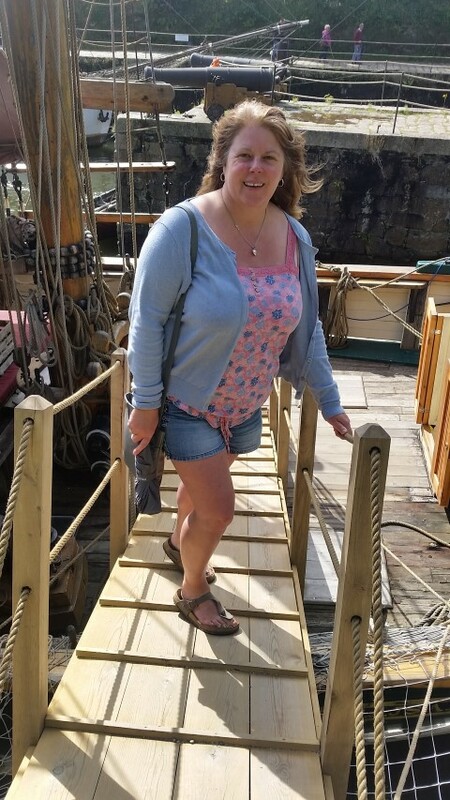 Mainly sun with the odd cloud, which gave us plenty of opportunity to explore the areas of Padstow we had previously missed. Three nights was one of the longer stops of the holiday, but time to relax and change the tempo for the next few weeks ahead was always the intention of this particular part of the break. 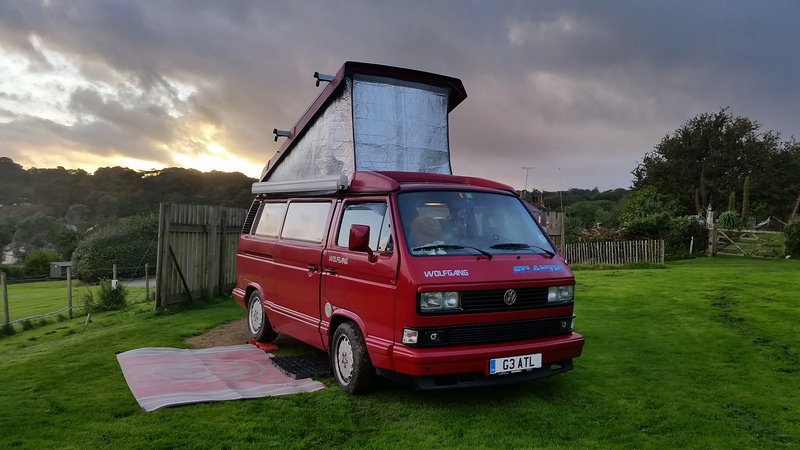 The stress of work, and the issues I had with the gearbox had kind of taken their toll on the run up to the holiday, but this was just what we needed. 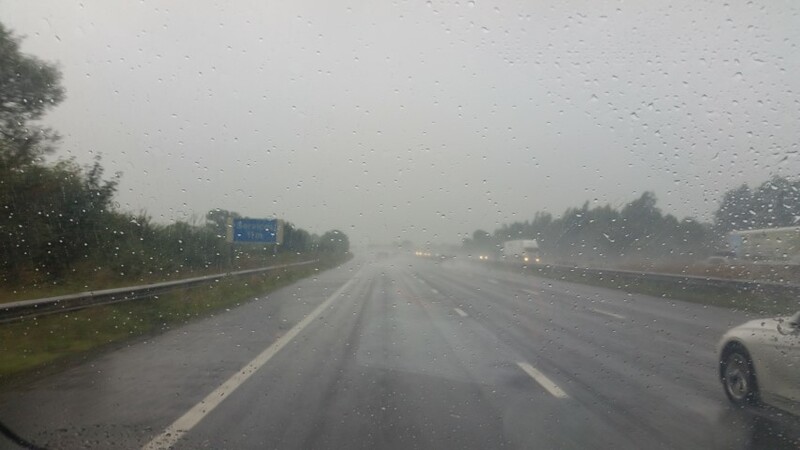 The first stop of our three week holiday was only ever going to be an over-nighter to break up the journey from Derby to Cornwall. Not because I felt it was too far to travel in one stint, but more to do with the fact we wouldn’t be able to leave Derby until late afternoon due to a christening we were attending. We would usually choose to leave early morning but this was not an option. 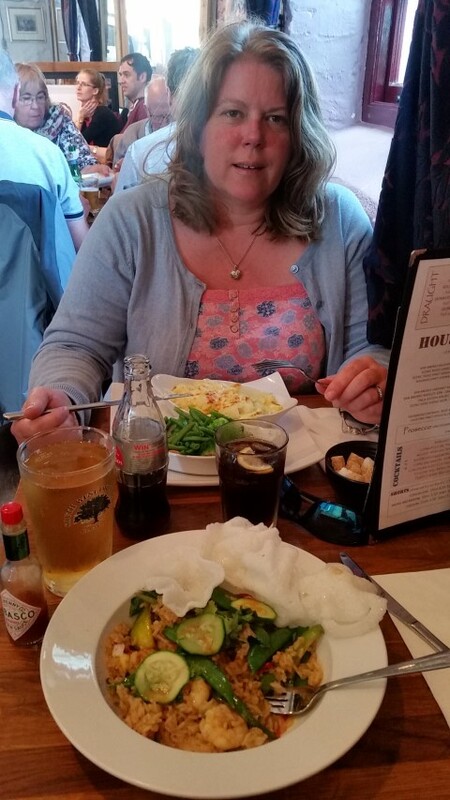 I felt that three hours drive would put us in a good location to be able to visit somewhere on the Monday before our firsts main stay of the holiday in Padstow. 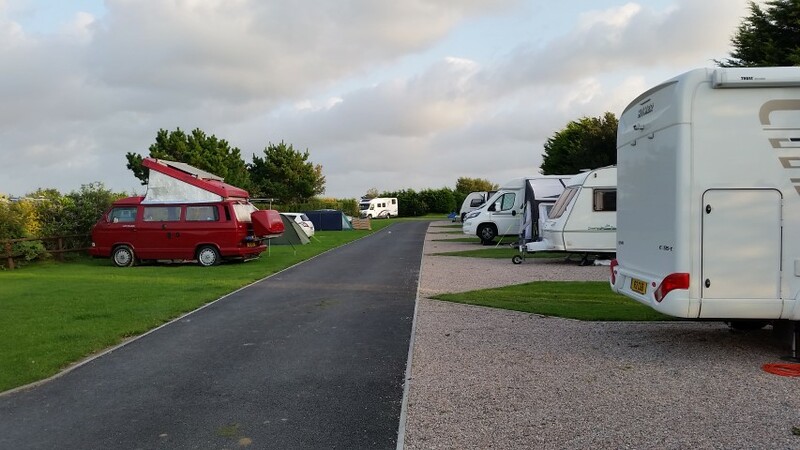 As we approached the campsite at around 7pm I realized that the decision to not to attempt the drive to Padstow in one go was the right one. 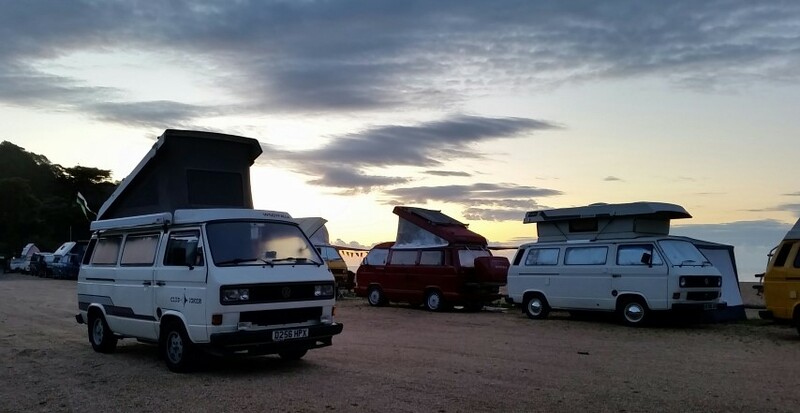 The day had been long and busy, and the campsite was a welcome break. The weather wan’t fantastic, but I could live with that. Both Mandy and I knew we had a stress free three weeks in front of us. There was plenty of time for sun. For now we were just going to chill! Bed came early and before we knew it were were getting up for a coffee and a shower the following morning. 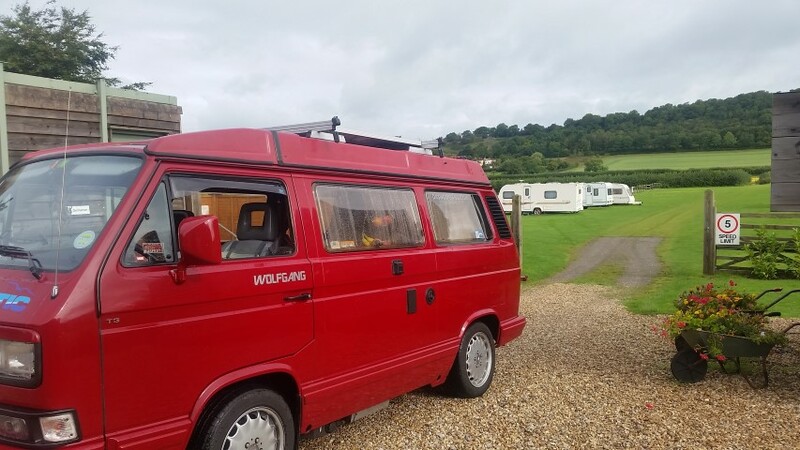 The shower facilities were good, the pitches had electric hook up (not that we needed it) and the views of the surrounding countryside were excellent. It was a bit of a shame having to leave so soon, but we had to remind ourselves this was only ever going to be a stepping stone to greater things.